For many parents getting around with 2 is a challenge because they are short on space at their home or they prefer to not have to push a long or wide double stroller. With it’s compact fold and ‘stadium’ seating design, the Kinderwagon Hop stroller solves both these issues, while giving 2 kids a comfortable ride. 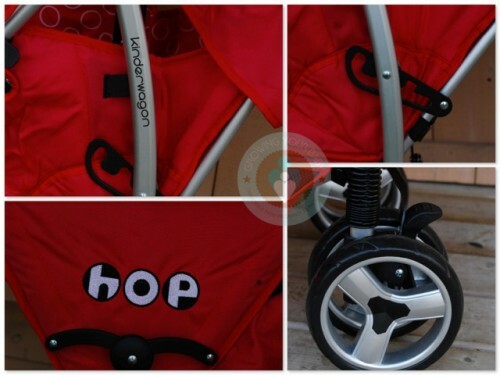 Unique to anything in the North American market, the Kinderwagon Hop is essentially an umbrella stroller that has a second seat that takes advantage of the back space of the stroller. When I first saw the HOP I wasn’t sure that this stroller would work for us because I always have to convince child #2 to sit in the back because he can never see. I was pleasantly surprised however, when I put him in the stroller and realized that he has a pretty good view. Obviously not as good as they guy in the front, but definitely not the back of the seat view he’s been used to in our current inline tandem. For comfort, both seats on the Hop are padded and include 5-point harnesses. The front seat has a non removeable bumper bar and a slight recline, while the back seat has a 3-position recline that would be good for a nap, but not completely flat for a baby. 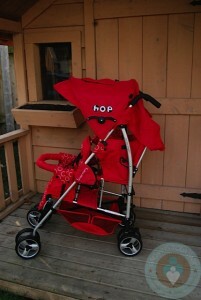 The Hop opens exactly like a standard umbrella stroller. The wheels drop down and and the chassis locks by standing on the mechanism at the back. The frame does have the ‘classic’ umbrella hinges, but they are covered with zippered pockets. The canopy on the hop is a good size. This is in part to the fact that it has to cover 2 kids. In order to achieve the ‘stadium’ seating while also keeping both kids covered from the elements, Kinderwagon has had to raise the height of the canopy. This is a bit of an issue for me because I am only 5’5 and I have trouble seeing over it while I’m out. With that being said, my husband, who is 5’10 has no problem at all with this. To help you keep track of your little ones the canopy has 2 peek-a-boo windows that can be tethered to stay open. While out during a test recently I realized that if you open the front window and it makes it easier to see where you are going. Weighing in at over 35lbs each, my boys are close to the weight limit for this stroller and you can feel that when you push it with both of them in it. It performs much better when loaded with kids that are around the 20lb mark (my twin niece and nephew) and does quite well with the littlest one in the back. For storage the Kinderwagon has a basket underneath that is bigger than that offered on a standard umbrella stroller. It is unsupported so you can’t load it up but it could definitely do a change of clothes, snack and supplies like diapers and wipes. The basket is easily accessible through the side of the stroller. For a comfortable push Kinderwagon has turned the handles under, which I actually like as it helps steer the stroller a little better. During our test we took the stroller to the park, market and the mall where we were stopped by parents constantly asking about the unique design. While it is essentially a single ‘disguised as a double’ it does have a longer frame than a ‘standard’ umbrella, so it is weighted more evenly across the front and back and won’t tip even if you have one child riding in the back. To allow it to hold the weight of 2 and give it a smooth ride there are suspension springs on the back 4 wheels. The back brakes are easily engaged and are also ‘flip-flop’ friendly. Folded, the HOP reassembles a single umbrella stroller with the convenience of actually transporting two. The model I have has a latch strap, but that will be replaced very soon with a clip. Kinderwagon will also be adding a new and improved enclosed hinge, a larger footrest for the front seat and easier one hand recline mechanism for the rear seat. 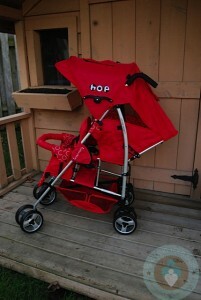 For a stroller that weighs just 21.5lbs, the HOP is a great choice for busy parents who have 2 young children. It’s compact design ensures that you don’t need to take up a lot of room storing the buggy and that you will always have something that will accommodate your busy lifestyle. At just $299 it is priced reasonably for families looking for a stroller that will go anywhere, anytime. Thanks for the post. 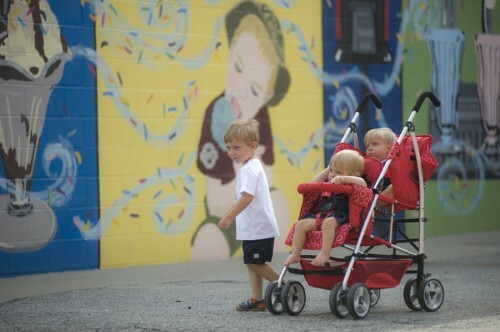 Looks like the perfect strollers for my twins!